There are some specific requirements in order for a metal stamping to be considered a deep drawn stamping, such as the depth and length of the shape must be greater than one-half of the diameter of the shape. Deep drawn stampings can be formed from various kinds of sheet metal, including steel, aluminum, titanium, zinc, and nickel, and the softer the metal is, the thicker the deep drawn stamping can be. Some common shapes that the deep drawn stamping process is used to make include cylindrical, square, rectangular, shell-like and cup-like. 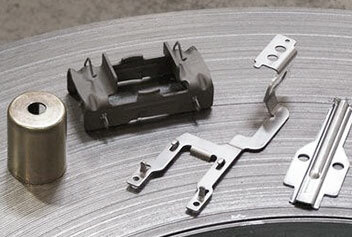 From these various shapes, a wide range of products can be made, for applications and industries such as: electronics, in which deep drawn stamping is used to make metal components for computer disk drives such as connector shells; automotive, in order to form motor housings and oil pans for diesel engines; food and beverage, for packaging applications such as deep drawn cans and cups; and industrial manufacturing, in order to provide parts and components such as large equipment enclosures and smaller components such as fasteners and washers. Often used in the tool and die industry for metal forming, deep drawn stampings use a punch to convert flat sheet metal into the desired 3D shape by means of mold, form, or die. The machine through which the deep drawn stamping process occurs is known as a press, the most common of which is a hydraulic press. A hydraulic press is a machine that uses hydraulic pressure, or fluid pressure, in order to exert force on an object. A die is a press tool for cutting or forming material in a stamping machine and is a cavity that is shaped as a mirror of what the desired end product should look like. To begin deep drawn stamping, the blank, or flat metal sheet, must first be moved over the die or shaping will not occur. The movement of the blank is possible as a result of several factors and parts of the press. First, on both sides of the opening of the die cavity there is a part known as a “blankholder”. A “blankholder” acts in the manner its name suggests, by holding the blank still and allowing for deep drawn stamping to occur. The process begins to occur with the introduction of the punch, which is used to drive the blank into the die cavity and thus create the desired shape. Deep Drawn Stampings Deep drawn stamping is a metal stamping process in which flat sheet metal is turned into three-dimensional (3D) shapes and forms.